Background: The nose presents in a wide variety of shapes which are important to recognize when planning rhinoplasty surgery. One of these shapes is that known as the amorphous or juvenile nasal tip. It presents as a large bulbous nasal tip that is very soft and spongy. The nasal skin is thick and is greatest in thickness over the tip. This indicates that the cartilaginous support is deficient and /or lacking. Often the upper two-thirds of the nose is disproportionately smaller. This type of nasal shape is called the juvenile nose because it is not unlike that of a baby’s nose…underdeveloped nasal bones and a soft and amorphous tip that is the dominant feature of the nose. Reshaping the juvenile nose to make the tip smaller and improve its overall shape is more about addition than subtraction. A purely reduction approach will not be successful and can even make it look worse. Case Study: This young Mexican-American female had never liked the large tip of her nose. She had a very broad and soft nasal tip with very thick skin. The nasal dorsum and radix were low with a significant dorsqm-tip discrepantcy. Her goals to have a smaller nasal tip that was less wide and proportionate to the rest of her nose. 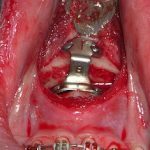 Under general anesthesia and through an open rhinoplasty approach, a large septal cartilage graft was harvested which also permitted the septum to be straightened and the right interior turbinate to be reduced. A columellar strut graft was placed and the nasal tip reshaped by a cephalic trim, dome and lateral crural spanning sutures. The nasal tip was defatted on its underside. 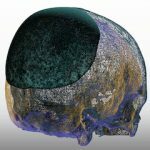 The nasal dorsum was built up with a single layer septal graft with crushed cartilage grafts to the radix. Low lateral nasal bone osteotomies were then done for upper third narrowing. Her immediate result after closure showed a more narrow and shapely tip with an improved dorsal-tip relationship. 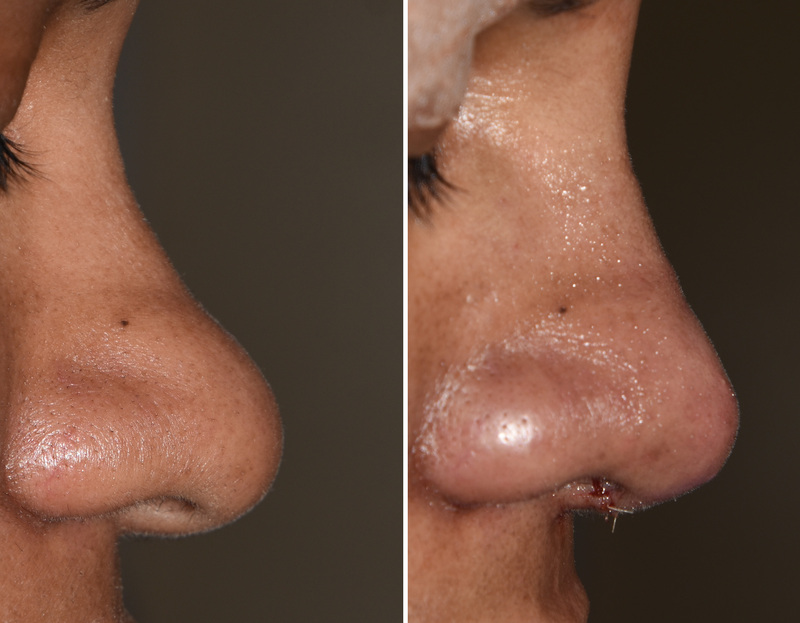 She will require 5-FU injections in the nasal tip in the first few months after surgery to reduce the risk of scar tissue buildup and recurrent tip thickening. 1) The large amorphous nasal tip has broad but soft cartilages that lack caudal septal support. 2) In reducing the broad and soft nasal tip, columellar support by grafting is critical to shape the nasal tip around it. 3) Building up the low nasal dorsum is helpful in making the nasal tip look less big.